The Sun continues to pose questions for scientists, such as the way solar cycle variability works and the surprisingly intense heat of its corona, compared to its surface. 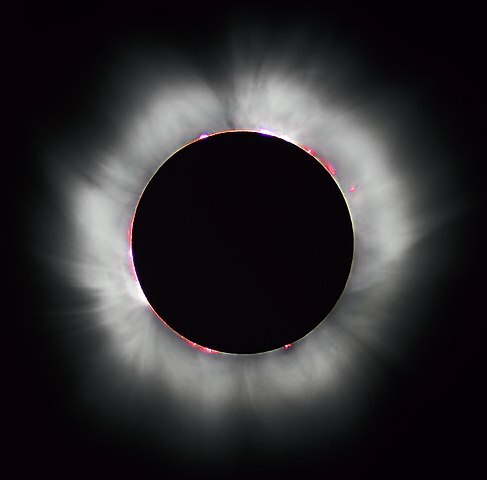 A team of scientists who collected numerous observations of last summer’s total solar eclipse via telescopes and electronic cameras has used the data to better understand motions within the solar corona, the Sun’s outer atmosphere, says Space Reporter. Jay Pasachoff of Williams College in Williamstown, MA, who led the team in observing the eclipse in Salem, Oregon, presented their findings to the 232nd Meeting of the American Astronomical Society (AAS) in early June. His team has observed numerous solar eclipses during various times in the 11-year sunspot cycle. The Sun’s corona is visible only during the total phase of a solar eclipse, which lasted about two-and-a-half minutes on August 21, 2017. “We could see giant streamers coming out of low solar latitudes as well as plumes out of the Sun’s north and south poles, all held in their beautiful shapes by the Sun’s magnetic field. In the months since the eclipse, we have used computers to pick out the best part of dozens of the images to make extremely high-contrast images that allow us to measure motions at extremely high speeds in the corona, as we compare our composite images with some made by co-ordinated colleagues 65 minutes farther east along the path of totality,” Pasachoff said. Incredibly, motions within the solar corona attained speeds of several hundred miles per second during the eclipse. Because the sunspot cycle is approaching solar minimum, when the Sun is least active, coronal streamers extending millions of miles into space were seen only in the Sun’s equatorial regions, he explained. Thin gas plumes were seen extending both north and south of the Sun’s disk. Although the solar corona is about one million times fainter than the rest of the Sun, it is also significantly hotter than the Sun’s surface for reasons scientists do not yet fully understand. Is this team not aware of ground-based coronagraphs that enable viewing the sun’s corona all day long in clear sky? Many impulses which can impact our magnetic shield originate from the solar wind, charged particles in the form of plasma that continually blow off the Sun, or are a result of the complicated interaction of the solar wind with Earth’s magnetic field, as was technically the case for this event.